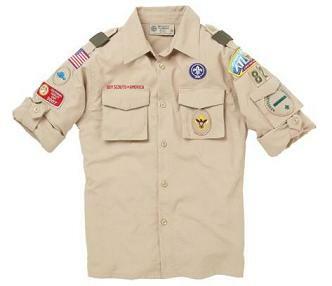 The BSA Centennial Uniform is here! The colors are pretty the same so new uniform pieces can be transitioned as old ones are outgrown. A big difference is red shoulder loops and unit numbers are now forest green. The uniform is being promoted as more versatile and wearable in the field instead of just for meetings. Today's Scouts and Scouters wear colored shoulder loops to indicate the branch of the Scouting family to which they belong. Cub Scout leaders (and Webelos Scouts who choose to wear the Boy Scout uniform) wear blue loops (other Cub Scouts and Tiger Cubs do not wear loops), Boy Scouts and their leaders wear red, Varsity Scouts and their leaders wear orange, Venturer's and their leaders wear green, District and Council Scouters wear silver, and Regional and National Scouters wear gold.